Games Workshop deal extension signed. THQ has signed a new "multi-year" extension on its exclusive Warhammer 40,000 licensing agreement with brand owner Games Workshop. A more specific timeframe wasn't put on the deal, but it covers all relevant platforms including "core, social and mobile rights." The announcement also noted that the Warhammer 40,000: Dawn of War RTS titles have now sold 6.5 million copies. "The complex, futuristic war-torn universe created by Games Workshop equipped THQ's award-winning development teams with the material to create one of the most loved PC franchises - Warhammer 40,000: Dawn of War," said THQ CEO Brian Farrell. "Our envisioning of the Warhammer 40,000 universe will continue to grow with top quality games across all platforms, including the upcoming launches of Warhammer 40,000: Space Marine and Warhammer 40,000: Dark Millennium Online." Games Workshop boss Mark Wells also chimed in, adding, "We know that the depth of the storylines, characters and imagery of the Warhammer 40,000 universepositions the IP to excel across many media platforms. "Extending our agreement with THQ will help ensure that Warhammer 40,000 maintains a strong and growing presence in the video game space." 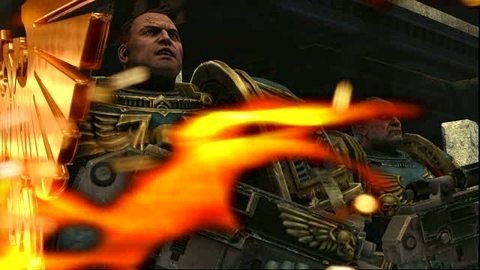 Space Marine, trailered below, is due out on PC, PlayStation 3 and Xbox 360 in Q3 2011, while the Dark Millenium Online MMO is still without a confirmed launch window.